Character LCDs are one of the most common things one gets in an Arduino kit. They are very cheap and fun to work with. They are categorized in two categories: one that is directly hooked up to the Arduino board, and another that uses an I2C module between LCD and the main board. In this project, I've used one with pre-soldered I2C module to minimize the number of wires. Wire up the components using the schematic below. Upload the code mentioned below to your Arduino Nano/Uno. 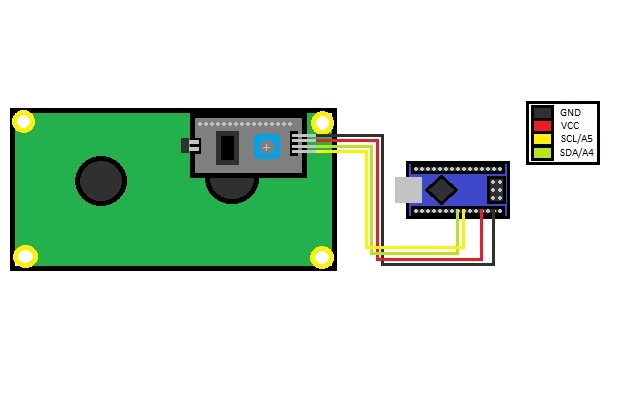 Make sure your Arduino is connected to a Windows Computer. Use the download button below to download the program. Run the program and enter the Serial Port number (ex., if it's COM4, type 4). NOTE: This will not work on displays other than 16x2 Character LCD. Each wire is color coded. Have you ever tried the SerialDisplay Example that comes with the LiquidCrystal_I2C Library? This one's the exact same code. I am very passionate about coding, I can code in any of the top 5 languages (most comfortable in python).